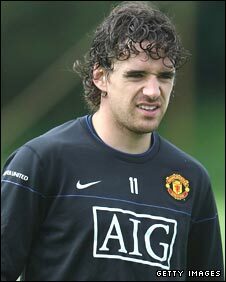 Manchester United's Owen Hargreaves has been ruled out of England's opening World Cup qualifiers, adding to Fabio Capello's problems in midfield. Hargreaves, who joins Steven Gerrard on the sidelines, has tendinitis in his knee and will also not play in United's Super Cup game on Friday. United boss Sir Alex Ferguson confirmed Hargreaves will not be fit for England's games on 6 and 10 September. "Owen will not be ready as he needs recovery time," said Ferguson. England begin their 2010 qualifying campaign against Andorra in Barcelona next Saturday, before a key game against Croatia in Zagreb four days later. Liverpool captain Gerrard has already been ruled out after undergoing groin surgery and will be sidelined for two weeks. What will England's midfield look like in their World Cup qualifiers? And Capello mentioned Hargreaves as a serious candidate to play following his side's disappointing 2-2 draw with Czech Republic at Wembley earlier this month. But Ferguson said the 27-year-old was not ready for the rigours of international football. "Anyone could play against Andorra. But Croatia is different - you need players who are 100%," he said. "We sent Owen to the right specialist and he had the right treatment, so it is just a matter of him getting on with it now. "It has not been easy for him. Having tendinitis can be irritating for a player. "But he has trained for 10 days and it is now important to give him some minutes on the pitch. "I think it (the England games) will be too early for him. He is not ready for that."